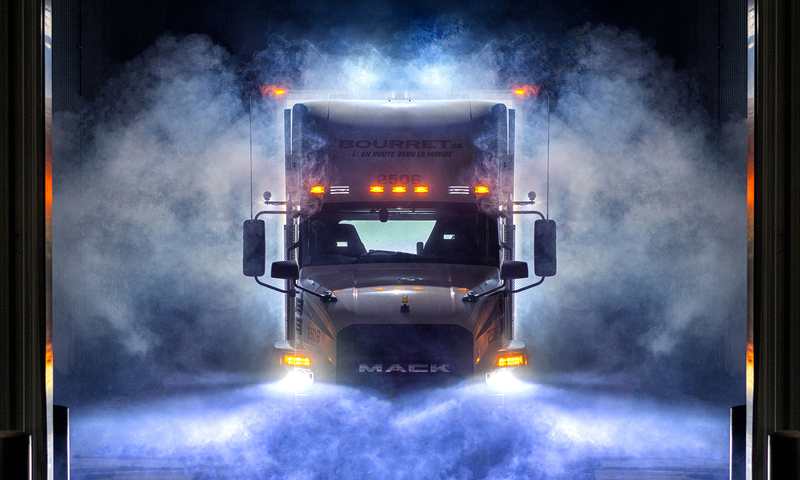 BOURRET, YOUR HIGHWAY TO THE WORLD… WITH THE NEW MACK ANTHEM! The Bourret Group continues its long relationship of trust with Mack by welcoming in its fleet 26 units of the new Mack Anthem. We are one of the first companies in Eastern Canada to receive such a large fleet of this new generation of semi-trailer trucks. The all-new Mack Anthem redefines driving as it has been designed to handle all types of road conditions more easily. Moreover, it must be said that its new completely redesigned look is not only eye-catching. It allows a significant increase in the aerodynamics of the truck. The reduction in wind resistance allows fuel savings of up to 3% per vehicle. In addition, it is important to mention that the cabin has been completely reconfigured in order to better meet the needs of the trucker. The cabin now offers a much larger interior and outstanding comfort. In this way, our employees feel a little more like at home, especially over long distances. In particular, inside the long-distance version of the Mack Anthem, drivers are able to stand in the cabin to get to bed. This new interior therefore significantly improves the quality of the working conditions of our truckers. From a security point of view, improvements have also been made. The Mack Anthem is equipped with a rear camera and several sensors allowing the driver to react more quickly if something is behind the trailer, or on the sides in its blind spots. In this way, the safety is improved for people who find themselves in the vicinity of the vehicle, in the field, on the road, or for the goods transported by the truck. It should be noted that the audible volumes of the alerts are adjustable, which is also an addition to the built-in safety features of this truck. The new Mack Anthem represents the raw strength and determination of our truckers, which is why we are proud to welcome it into our large family.